The pharaoh ant (Monomorium pharaonis) is a small (2 mm) yellow or light brown, almost transparent ant notorious for being a major indoor nuisance pest, especially in hospitals.The pharaoh ant, whose origins are unknown, has now been introduced to virtually every area of the world, including Europe, the Americas, Australasia and Southeast Asia. Colonies do not display aggression toward each other; this is known as unicoloniality. 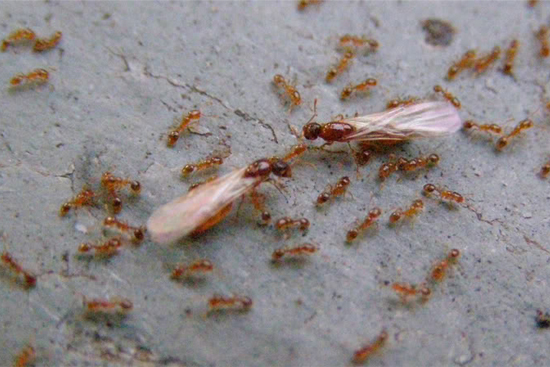 Monomorium pharaonis is also notable for its complex foraging system, involving intricate trail routes maintained with several pheromones. It was the first ant species discovered to use a negative (repellant) pheromone. These chemicals are integral for communication in this species. 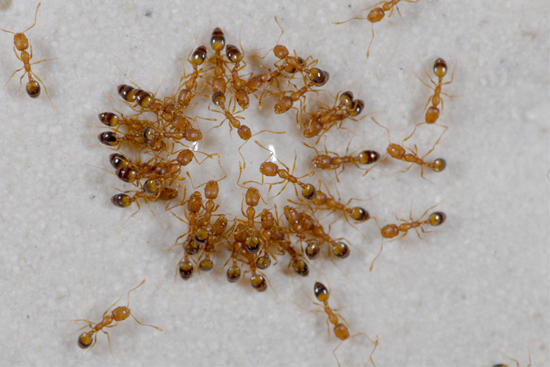 Pharaoh ants are a tropical species, but they thrive in buildings almost anywhere, even in temperate regions provided central heating is present. The pharaoh ant queen can lay hundreds of eggs in her lifetime. Most lay 10 to 12 eggs per batch in the early days of egg production and only four to seven eggs per batch later. At 27 °C (80 °F) and 80 percent relative humidity, eggs hatch in five to seven days. The larval period is 18 to 19 days, pre-pupal period three days and pupal period nine days. About four more days are required to produce sexual female and male forms. From egg to sexual maturity, it takes the pharaoh ant about 38 to 45 days, depending on temperature and relative humidity. They breed continuously throughout the year in heated buildings and mating occurs in the nest. 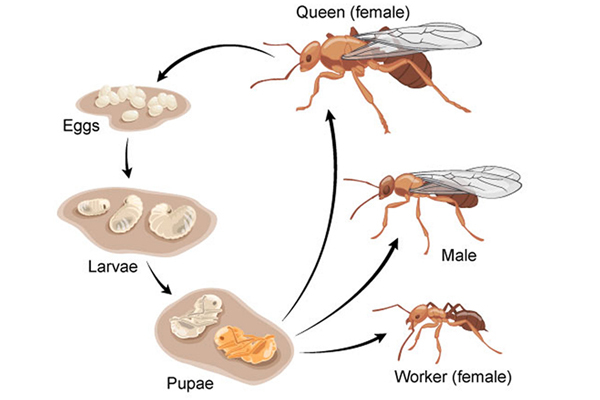 Mature colonies contain several queens, winged males, workers, eggs, larvae, pre-pupae and pupae. Unless you use a non-repellent spray, baiting is the preferred treatment over typical residual spraying. Baiting is the most reliable way to eliminate the entire colony. When choosing ant baits, it is best to choose from both the sugar-based baits and protein/grease-based baits.